Like the charts and data that I’m posting? Want to support the ongoing work of this site? Good news, everyone! You can becoming a member of Seattle Bubble and get access to the data as well as other perks! 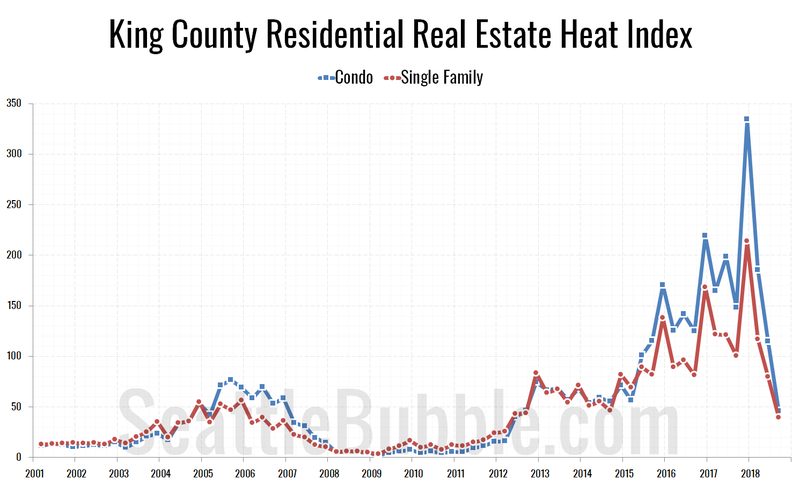 We haven’t taken a look at my “Residential Real Estate Heat Index” for King County single-family homes and condos since the fourth quarter 2017 data, so let’s see how it has moved through 2018 so far. Wow, that’s quite the reversal this year from the recent trend. After hitting a massive all-time high in the fourth quarter of 2017, just three quarters later the index has fallen to its lowest point since the first quarter of 2012. Coincidentally, the first quarter of 2012 was when home prices in the Seattle area hit their lowest post-bubble point. This measure is typically highly seasonal, peaking in the fourth quarter most years due to the low number of listings. However, after dropping down to earth in the first quarter, the heat index usually stays fairly stable through the first three quarters of the year. Not so this year. The first quarter was down slightly year-over-year, then the second quarter hit a three-year low, and the third quarter was the lowest level in over six years. I still don’t think this decline portends another big bursting bubble anything like what we saw 2008 through 2012, since the foundation of the market is much stronger than it was ten years ago. That said, it is definitely becoming very difficult to ignore the dramatic signs of the slowing market here in the Seattle area. Next year is going to be very interesting. Methodology: The “Residential Real Estate Heat Index” is an index that rolls changes in the median price, new listings, total inventory, pending sales and closed sales all into a single number to measure the relative “heat” of the market. The formula is [100 × (median price ÷ median price last year) × (number of closed sales ÷ end-of-month inventory) × (number of pending sales ÷ number of new listings)]. Individual monthly index values are averaged to arrive at a value for each quarter. Note that this index only looks at the real estate sales market as reported by publicly-available data shared by the NWMLS. It does not factor in any other economic conditions such as wages, interest rates, rents, etc. You can download the full data set by becoming a member of Seattle Bubble. Case-Shiller: Seattle home prices fell more than anywhere else between July and August. I tried to read your comment. Then I got lost and quit. RE: Erik @ 500 – Go to the blog. Amazonians conversing on how to use their RSUs (no tangible value until vesting is complete) as down payment. That is a VERY risky down payment. Well, if they cash them out, then they have the money and there’s no risk. Counting it as part of income to qualify for a mortgage definitely is though since the RSUs won’t last forever and their value can change wildly. I read the article you posted and somewhat understand that one about Rsu. The reply I got lost on was when you were bashing Kary, the lawyer/used house salesman hybrid, hilarious. I think there was some inflection in your voice that didn’t transfer to writing so well. Please elaborate. My favorite thing about the sea bub comment section is when one commenter attacks another commenter, so please clarify why you think Kary is no good. I remember you saying that “sellers are rushing to the exits.” Chalk one up for Kary. No, he admittedly only said it twice. So clearly I am lying! RE: Justme @ 495 – Kary has a case of the “I can’t help its” He’s a used house salesman AND a lawyer (aka liar). When they talk, they work to spin, confuse, and pick. Actually I try to clarify, but it’s telling you didn’t even attempt to discredit anything I said. It’s also telling that you find what I say confusing. I’ll admit I do sometimes type things out so fast that I could be clearer, but I do try to correct those situations if still allowed by the 10 minute edit rule. Here’s an interesting piece on tech industry location considerations, and the pros/cons of locating here in Seattle for the gaming industry. It doesn’t really stick out well on Geekwire’s homepage for some reason–so it’s easy to miss. The most common situation that needs to be disclosed is that the buyer is getting a loan, and that is typically done with a financing contingency form or Form 22EF. It also means even holding Amazon stock would not be proper unless disclosed. That would be done using a Form 22EF. But basically a seller should not have to worry that the buyer might not be able to buy if the stock market crashes tomorrow, or if they do have to worry that it’s a disclosed situation and a situation they chose to get into. Let’s put it this way, when a small business I interact with starts on a screaming rampage over budget cuts [King County disabled budgets have been cut about 50% for my severely disable son the last few years] and yet still have to maintain a decent plan to feed, care and house him anyway…they somehow blame me. I’m the devil with horns to them, living the easy life on retirement without a care in the world [LOL]…while they watch Social Security and Medicare get thrown into the trash fire for them? The owners of these disabled real estate chunks [usually big houses with two kitchens] had dollar signs [with big mortgages] in their eyes over real estate price growth [many are landlords too], as they”continuously” remodel and care for these businesses better than we need to [they’re State monitored and inspected] to qualify for codes. Then the property tax doubles over the years and I just saw a sign on Kent east hill new homes…”prices reduced $25,000″…..folks on high mortgage debt are gonna need therapists if this keeps up…. Even without much manufacturing smoke stacks, America is rated light brown anyway on air pollution. We need clean coal now desperately in the world….where would we put the solar cells in Beijing anyway, there’s no room for them in that crowded city?…wind power, LOL, a joke practically anywhere too, where would we put the huge rotating blades and generators? Even shale oil in America becomes a cost joke when the oil price spikes below $80/bbl. Seattle Real Estate is dependent on this unclear future? Lord help us. I decided to restart my search after hearing all the news about slowing sales. Turns out, most of the available homes are still severely overpriced. I am looking in Redmond/Kirkland. Guess I’ll wait few more months. 80k reduced so far and the open house this weekend was………crickets. RE: Blurtman @ 479 – There are at least three reasons that the US spends more on healthcare. 1. We earn more money. We probably spend more on bananas because of higher earnings too. 2. Our tax system doesn’t tax employer contributions to health insurance and that means people get more health insurance (now primarily lower deductibles) than what they would otherwise get. That drives up their consumption of health services and medicines. 3. Insurance when it does kick in means people no longer care what things cost, so price is no longer a hinderance to consumption, which drives up demand and prices. This is the point I have been hitting on above. Not only are the conclusions you’ve reached wrong, but many of your premises are wrong as well. You have absolutely no qualifications, nor have you provided any systematic analysis or review of others’ analysis, to be telling us why healthcare spending in the US is higher than in the rest of the world. 1. Other countries with higher GDP per capita than the US spend less on healthcare than the US. I know you’ll respond with an excuse that tries to explain why you were actually correct in this assertion, but you are wrong. Period. 2 and 3. We, as individuals, have, on average, some of the highest out of pocket healthcare costs in the world. In fact, within the US the trend has been the opposite of what you suggest, with employees taking on more and more of the cost of their monthly insurance premiums and having higher deductibles and copays. We do not spend more on healthcare because it’s just being “given” to us with no financial responsibility. It’s the opposite. We are making individuals pay more and more out of pocket hoping that it will control the out of control cost of healthcare in the US. Again, I await your excuses. But you’re just plain wrong. Does this bother anybody else? It’s only healthy for those who PROFIT from the churn! Of course, that does include several commenters on here. During the 1998 dot-com boom someone coined the term B2C for Business-to-Consumer e-commerce. As the bubble burst, some humorist said that it really stood for Back-to-Cleveland, in honor(?) of all the midwesterners that had gone to California, and then went back. What will it be this time? B2C may mean Business-to-Cloud, and soon enough become Back-to-Carnation or Back-to-Covington. Other contenders for fun acronyms may be Back-to-Bainbridge, Back-to-Burien, Back-to-Everett and Back-to-Enumclaw. No ill will intended towards these otherwise fine communities ;-). Remember the Dire Straits song “Money for Nothing”…. And Who Defines if Artificial Intelligence (AI) is Real? I’d say controlled robotics with S/W is real, but even the “joke” proof that AI is now real is farfetched to me [it looked like corruption commands coming out of two linked computers at the same time and the AI gurus somehow call it machine talking to machine?]. How Has the New Nervousness Affecting Our Sister Sanctuary City LA? I know, just ban guns and its fixed? Then they just smash large diesel trucks into the nightclub? Criminals always get guns anyway, so they used their guns….the fun goes on and on…. Here’s an article on the Obamacare increases in Washington–an average of 13% on the state system, but again mine was over 20%. With a 13 percent premium increase, and inflation at about 2 percent, the cost of health insurance is going up at a little more than six times the rate of inflation. There goes your pay raise. Unless you’ve been getting pay raises of 13 percent a year. If you were making, for example, $50,000 a year in 2008, a pay raise of 13 percent a year would have you making $170,000 today. So there’s the key — start insisting on 13 percent annual pay raises. First, your pay raise wouldn’t need to be 13% to cover your premium increase unless all of your expenses are for health insurance. Second, most the people paying these premiums don’t get raises, or even pay. Such people would be employees and likely be getting employer paid healthcare, their share of which would be different than the overall increase. Third, you can’t just demand and get a pay raise because one of your expenses goes up. BTW, in King County the state system apparently only has one HSA qualified offering, so the choice there is going down there too. On the real estate front, using a very small sample of new development projects (two by the same large national builder), it appears that the builders are selling much later in the building process. A couple of years ago the houses were sold near the pouring of the foundations. Now the houses are nearly complete and still on the market. And as I think I’ve mentioned before, price reductions have been including new construction. Throw the ACA in the trash heap. Also on the RE front, for the first nine months of the year there were roughly 50% more cancelled and expired listings in 2018 compared to 2017. (King County SFR.) That’s additional evidence of overpricing. From the buyer’s point of view this new market is much more relaxing, but finding the right house is still not necessarily easy. There’s a lot of junk out there in the active numbers, even ignoring price. Numbers from NWMLS sources, but not compiled, calculated or guaranteed by the NWMLS. then, what else is new? When MSFT X-BOX games are our new manufacturing. Compared to O/S revenue [Windows 10, etc…] the games are a complete joke sales dollars ways…. not junk (yet), but 3x?? but is it done yet? Amazon has a long, long way to fall. I wonder if Microsoft will be acquiring Amazon shortly to stabilize things. Bezos would report to the Head of the XBox unit. I think it more likely Amazon would acquire Microsoft. RE: biliruben @ 535 – Maybe if they have short memories. I see such a merger as being too risky for either of them. No, it wouldn’t, and shouldn’t happen. I said it was more likely. Which in this case means 2% chance rather than 1% chance. I don’t see the benefit to either, and would hopefully be struck down as anti-competitive. Though one never knows with the neutered Justice Department. They are completely different companies….one’s a warehouse company and the other is selling S/W plagued by quality problems [patches and viruses]…. Maybe a new company with O/S S/W without continuous viruses and patches can replace MSFT? It would be like replacing the oil burning Vega with a old reliable 6 cyl Dodge Dart….until then we’re stuck with junk. Are you serious? Do you see that amazon is based very much on software? They run a website with millions and millions of products and run cloud and streaming services. They are more than a warehouse company. Exactly. I believe there cloud service may their highest margin business. RE: pfft @ 537 – Whatever. I didn’t even bother reading your post since you don’t understand even the first concept, that prices are higher in places where people earn more money. That’s pretty basic, so when you said that was wrong it proved you don’t have a clue–once again. I would agree that would raise some serious anti-trust issues, but don’t assume our Justice Department is neutered. They seemingly are taking a close look at the T-Mobile/Sprint merger, where the Obama administration let our region get down to only two major grocery companies while simultaneously destroying a minor player as part of the process. To make that decision they were not merely neutered, but castrated and given a lobotomy. Case-Shiller home price index for Aug 2018 is out today. There you have it. Keep in mind that the Aug index value is an average of May-Jun-Jul home prices. We won’t have to worry about enough apartments in Seattle for all the AMZ warehouse workers…what workers? August index value doesn’t include May. It is June-July-August prices. Also, the Seattle CS Index dropped July-August in 2014 (170.87 to 170.85). So you are wrong that the last time it happened was 2012. Plus, I’m not sure why you are mentioning the total “point” drop in the index (-4.1), rather than the percentage drop (-1.5%) which is more applicable. It’s almost like you are trying to be misleading. The Open Border Party MSM alleges….I’m rolling on the ground in laughter now…they really think we’d swallow that lie? How Many Software Engineers Work for Amazon Vs. Factory Warehouse Worker MASSES? Look is up on the internet yourself. Its a warehouse company. I was a little too fast and did not see the -0.02 (-0.01%) drop in Aug 2014. It was not much of a drop, though, was it? But I can see you are really on the numbers today! Pretty exciting. It doesn’t sound like replacing Chinese student intern workers [low or no pay?] will be a training problem at all either. (Belated) weekend inventory update, graphical edition. As always, click on link, then click once more for enlarged view. 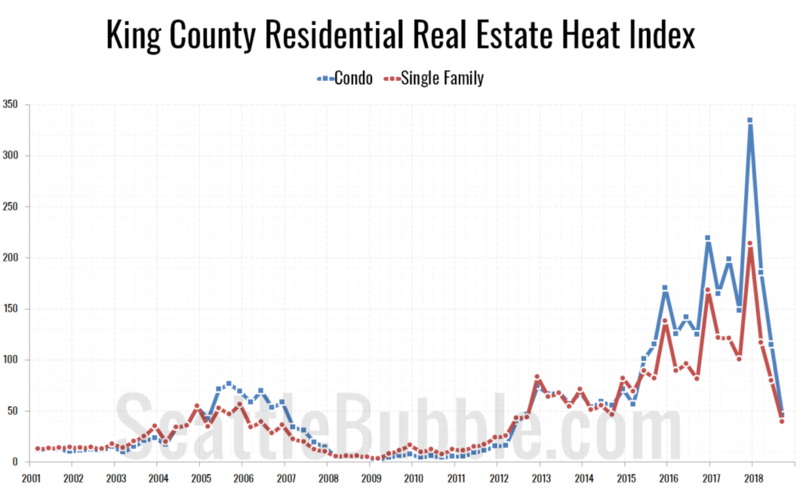 King County SFH active for-sale inventory 2017-versus-2018 on 2018-10-27. King County Condo active for-sale inventory 2017-versus-2018 on 2018-10-27. Much lower seasonal droop in for-sale inventory for 2018 compared with 2017, and from considerably higher levels: 1.78X (SFH) and 2.80X (Condo). Sure. Getting a negative yo-yo index value typically requires a number of negative mo-mo index values, right? It is still early days. But if I were a seller, I would not wait for the negative yo-yo value to arrive. Better get that property on the market now, and see if anyone will bite while the drop is still only -1.58%. Heck, the drop is likely bigger than that already. Thanks for the update justme. Amazon is not a warehouse company. They are an online services company. They may have more warehouse workers in total, but the total compensation to all those workers is just a small fraction of the tens of thousands pf software engineers they have in Seattle. It’s like saying Apple is a retail company because they have apple stores. By the way, Amazon stock is down 25% now since last month’s highs, quite a drop. Asians call ’em warehouse companies and so do I. But everyone can define anything in their own words, so I agree with you. Its like that term illegal alien in the Constitution being replaced with undocumented immigrant….word parcing in my book…BTW, what difference does make? I feel sorry for the people who starting working at Amazon headquarters this Summer and Fall. Their compensation is largely in stock units, and the stock is down 25% and dropping hard. The stock is down another 3% just today. It would be doubly painful if people bought an overpriced Seattle house, which has also dropped 6% or more per the Seattle Times article. Of course, the system likes to kick people when they are down, and I fear layoffs may be right around the corner because of the reduction in revenue growth evidenced this last quarter. Wall Street needs to be kept happy, and they’ll want to see some heads roll. The executives always cut heads first and ask questions later in this environment. I worry the bad news has only just begun in stocks, RE, and jobs. Shares of Seattle-based Amazon.com returned more than 900 percent from the first quarter of 2012 until September 4, 2018, and housing prices in the city have almost doubled since then, according to Case-Shiller. The company’s shares have dropped about 20 percent since the beginning of September and that’s already being reflected in the housing market. Home prices in the city fell for the second straight month, down 1.6 percent in August from the month before, the most since February 2011, according to the Case-Shiller Index released on Tuesday. There’s a chance that Seattle prices could start to decline next year, especially as higher mortgage rates curb demand, Fairweather said. Seattle properties are staying on the market longer, and selling for the asking price, even as inventory remains low, said Sol Villarreal, an agent with Windermere Real Estate Co., who largely works with first-time home buyers in the city. Hopefully they did use the RSUs! If they sold them a month or two ago for the house, they avoided the recent share price drop. RE: uwp @ 559 – BUT- several local banks are allowing the RSUs (unvested) to be used as down payment. Chase. Tech Credit Union. First Tech Credit Union. Amazonians reporting that they will use RSUs + bonuses in the DTI ratio. OMG, Justme might be trying to be misleading! Shocking! You need to focus on where they make their money. That’s what investors care about, and that’s what is relevant to the survival of the company. And as I mentioned earlier, using the local forms they either need to liquidate them prior to making an offer or disclose that they are needing to use them. The latter is unlikely but possible, and typically if that is disclosed a date to liquidate would be set (assuming a competent agent on either side). RE: sfrz @ 560 – Are you talking about down payment or income? Sounds like the latter. I don’t have time to provide you links with evidence of obvious information about how the world works. Take an economics course. Or did you already take a course taught by Kshama Sawant? That seems likely given how little you know or understand about economic matters.